Everyone who has created content for the dome will tell you that the best way to be successful is to have access to a dome. The problem is, there is not much access out there. Don’t be discouraged! There are several of us in the fulldome community working at making domes accessible to more people. Until then, I have created this document for artists who want to show their work in the dome and respond to calls for work. The fulldome world is one that is changing and expand fast and furious. 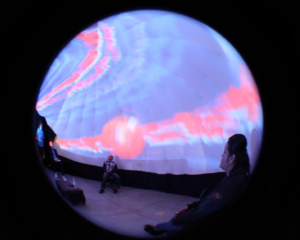 More start ups from around the world are helping push the art and innovation of what was once seen as just a planetarium into a whole other world of exploration for visual artists, VJs, interactive artists and filmmakers. Perhaps you have been to a dome show or you have not even stepped foot in a dome before, but are interested to work with this medium. Here are some tips and tricks that will help you to prep existing work as a dome master as well as create new work for the dome. Note: Every dome is slightly different, so you should always consult with the dome manager. But here are some general guidelines for preparing your files to show on a dome. Most domes in the world are 2k to 4k with the largest having an 8k projection (I believe there are four of these in the world now). A good solution is to make your work 4000 x 4000 or 3200 x 3200 squared. Your image will need to be a circle and all of your work will need to be fisheyed or spherized in order to display correctly on the dome. Below are ways in which to create these effects in various programs. Special thanks to my former student from IAIA, Louva Hartwell, for helping me create this information. Make sure image is square. No image outside of the viewable area in Photoshop, it has to be cropped to a square. Now run spherize filter at 60%. Raster circle cutout on separate layer with black background. Vector circle cutout on separate layer with black background. Make sure image is square. No image outside of the Artboard area, it has to be modified to a square. Now run Effect>Warp>Fisheye>Bend 60%. Sometimes this effect won’t give the desired effect on an image, I found so far that the image needs to be vector. Use Illustrator or Photoshop to spherize images. Created circle template using Circle Mask tool. Resized circle so it’s the same size as the stage. Use the Effect>Distort>Sphere on an image cropped to 3200×3200. Edit the Radius so it’s 1024. Center of Sphere should be 1024.0 and 1024.0. Use Render Queue to export your movie. Use the settings on Digital File Formats document https://docs.google.com/document/d/1QAPAwHIpa6Vr7BWHYjeWfdvjXNB9KiRHZK_4eVTojcA/edit?hl=en. Note: you need to delete the stroke prior to export. Created template with Circle Tool. Fill set to 0, stroke enabled (right click in circle and select stroke). Make top layer and add effects, animation, etcetera under it. Use Filter>Distortion>Sphere on an image cropped to 3200×3200. After applying this effect go to Filters tab in Inspector. Change the Radius to 1000. Exported using settings on Digital File Formats document https://docs.google.com/document/d/1QAPAwHIpa6Vr7BWHYjeWfdvjXNB9KiRHZK_4eVTojcA/edit?hl=en. Change Sequence Settings. Go to Sequence>Settings>General, then change Aspect Ratio to Custom, next change the width and height to 3200×3200. Effects>Video Filters>Distort>Fisheye to apply the Final Cut Pro fisheye effect to your square 3200×3200 image. A better option is to use the fisheye images you’ve created in Photoshop for this. Could not find a circle mask. When exporting, change your settings of your import to “Custom…” A Sequence Preset Editor will appear. Change your frame size to 3200×3200, your timebase to 30, and your compressor to Motion JPEG A. This is one of the major ways in which domes differ. Especially right now, there are various art friendly dome servers popping up and the majority of domes are using planetarium systems. Please refer to the dome manager for acceptable file formats for their dome. But here are some guidelines. Export a master copy of your file for archive and to use for conversion. Use JPEG 2000 codec and export as a .mov. JPEG 2000 is the standard for digital media preservation. This coded will never go away and is lossless. For SAT, vDome and Vortex Server: convert your project to HAPQ codec as .mov file. For sound, embed your 5.1 (preferred) or stereo audio into the .mov. How to export 5.1 surround using FCP and Apple Compressor. For planetarium systems: Image sequence of frames in PNG file format. Use 5 digit numbering sequence, eg. firstname_lastname2011_00000.png. Audio for planetarium domes: 5.1 Dolby Surround Sound you can use Software: Soundtrack Pro or Logic Pro to create wav files or AC3. 5.1 is standard for a dome theater. It breaks down like this – 1 font center, front left, front right, rear center, rear left, rear right, and a sub. You will want to use an audio editing program that allows you to export as Digital Dolby Surround like Soundtrack Pro or Logic Pro.You can submit sound as 6-channel mono wav files, 48khz, 16-bit (even if using a stereo or mono mix) or an AC3.